In the State Archives (Valdības Vēstnesis – “the State Herald”) notes are found by Mr. Raimonds Jonitis in Riga, about a temporary post office opened at “Buļļu ciemā, Kuģu ielā 7, 9 Einberga pārt.veikalā” (BuĮĮi village, Kuģu street 7, 9 Einberg’s foodstuff shop”). This post office was a summer season office with all postal services opened 01.06.1938 but closed 31.08.1938. Additionally is mentioned that a wrought postmark is delivered. There are also notes about temporary post ofices at Bulduri, Vienības prosp.35, 25, 76 with all postal services during the same time in 1938 but nothing about a postmark. Nothing is mentioned about 1939. However, mentioned is that during the summer season in 1940 no activities took place at these offices. In 1937 there were only telephone services during the summer season at Buļļu ciemā, Kuģu ielā 7 as well as at Vienības prosp.35 and 76. From Bulduri (post office at Bulduri prosp. 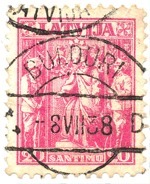 31 - post, telephone and telegraph office with all postal services) until now only two postmarks have been known - “BULDURI A” and “BULDURI B” both the type 6 postmark with segment bars. Now Mr. Ilgonis Šteinbergs in Riga shows me a cancelled stamp with the postmark “BULDURI D” and the date -8 VII 38. Is this the postmark used at the above mentioned temporary post office at BuĮĮi village? 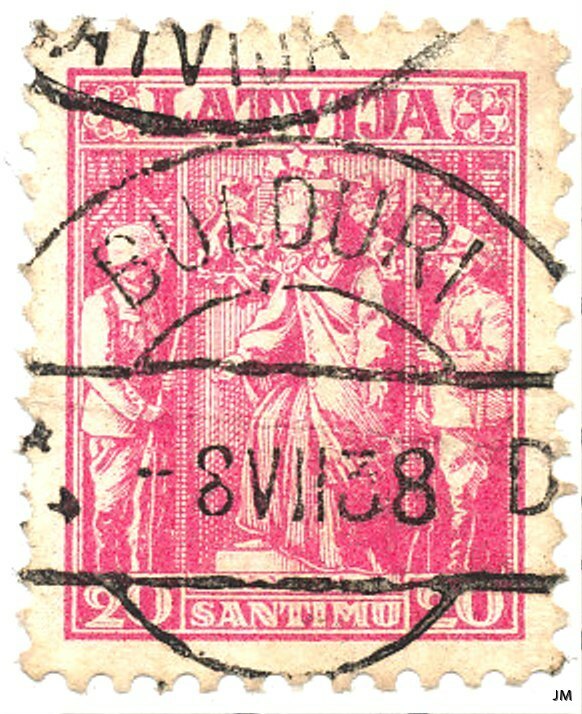 If a “BULDURI D” postmark exists it would be logical that also “BULDURI C” can be found as a fact that more than one temporary post office served these popular summer resorts. That this “BULDURI D” postmark is without segment bars is also logical as new produced cancels from this time were without the bars. So, start searching for unusual postmarks from Bulduri especially from the summer period in 1938! Me myself is very interested in a copy!